Product Manager in Heels: What is 'leadership', and how important is it for product managers? What is 'leadership', and how important is it for product managers? Leadership is a necessity for product managers, yet many of us can't quite figure out the definition. Go ahead, try and define it- it wasn't easy for me. The standard definition is "the power or ability to lead other people", but does that really encompass everything that leadership is about? A good PM could have customer research, projected sales, and even a planned timeline for completion - but if they aren't good leaders then they will have trouble getting the project off the ground. I've seen this happen to so many of my colleagues in past companies, and it recently dawned on me that not everyone is a natural leader. "Leadership isn’t about doing the work. It’s about building a team of talented individuals who can build and mesh together. Then you’ve got to give them some guidance." Jim Calhoun, CEO of Converse. Product managers need to focus on inspiring the team they've built that the project or product they're working on is important and will make a difference. Last week, I completed a certification program to be an internal coach through the Babson Executive Education Center. Part of the process involved gathering feedback through a 360 review. What is a 360 Review? 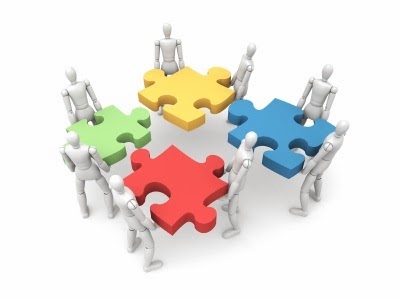 A 360 review is feedback that comes from members of an employee's immediate work circle. The feedback process gives people an opportunity to provide anonymous feedback to a coworker that they might otherwise be uncomfortable giving. Feedback recipients gain insight into how others perceive them and have an opportunity to adjust behaviors and develop skills that will enable them to excel at their jobs. (Contact me if you'd like a framework for this, don't go recreating the wheel!) I bring this up because I think the value of understanding your strengths and areas of development are key in understanding your own leadership capabilities. This type of feedback process allows others to provide honest feedback about your leadership style, and can help you develop so you can become a better leader. enable them to excel at their jobs. 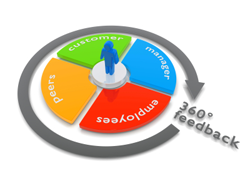 I encourage every manager to complete 360 reviews to gather feedback about themselves and their employees. Cross-functional leadership is vital to the success of any product manager. Sine many product managers don't manage huge teams of people, they typically have to influence others without authority. Leadership is a skill that is a MUST HAVE in this role. If you're struggling with leadership, start with the 360 review to understand where you might need to develop, and then focus on improving the relationships with everyone in your organization. I like the idea of the 360, although I've yet to participate in one. Do you think the results you get are any different from ongoing deliberate effort to include/serve all stakeholders in your product, and from polling them regularly about what they need? Thanks for commenting John! In my experience, the 360 feedback was extremely useful. It became more about me, and less about the project. While the project I was working on at the time certainly was a factor in the evaluations, it provided an outlet for others to provide feedback. It also gave me insight about some of the things I wasn't aware of. A 360 is meant to get feedback about the individual overall; collecting feedback about what the team needs during a project is specific to the project. Both are tools that I think are extremely valuable (and under-utilized) for product managers (and others!). Are you familiar with Gerald Weinberg's organic model of leadership? I mentioned it this blog entry where I debunked what I see as myths about leadership in the product management community. I noticed many of the definitions in the Business News Daily piece centered around the leader. The organic model of leadership inverts this orientation and focuses on empowerment of, not influence on, others. Hi Roger - thanks for the reference! You certainly bring up a good point about leadership focusing on empowerment - I hadn't thought of that. I really like the definition in your blog post: "Leadership is the process of creating an environment in which people become empowered." Product management is an area that needs to lead an organization, and they need to create a supportive environment. I also really liked your comment that product managers need to "establish mutually supportive relationships with others". This is key to any product managers success!